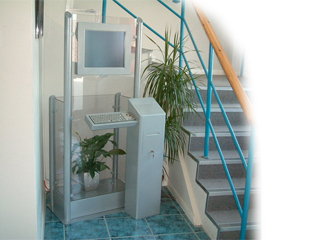 i-Touch V35 Full Sized Glass Floor standing kiosk with 17'' screen - Future Generation Kiosk Products. V35 is a stylish, minimalist glass model with options. Designed to be non intrusive this unit, pictured on the left, has the class and style to fit into both classic and modern styled locations, fitting in beautifully with the surrounding decor. As shown, this unit will accommodate options such as keyboard, printer and card readers. The rear is enclosed making it ideal for free standing in the middle of a floor as well as against a wall. It’s also great for demonstrating products etc. Or you can simply enhance the aesthetic appearance by using decorative items such as a pot plant. Please note. The pot plant is not included. Dimension: 650x1600x400/200 (WxHxD/Tower Depth). Weight: 101kg.